Cambridge researchers have found the strongest evidence to date that human pluripotent stem cells—cells that can give rise to all tissues of the body—will develop normally once transplanted into an embryo. The findings, published today in the journal Cell Stem Cell, could have important implications for regenerative medicine. 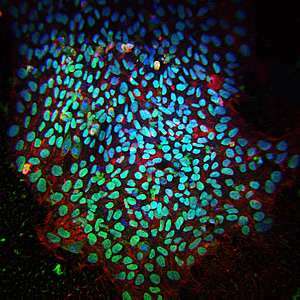 Human pluripotent stem cells for use in regenerative medicine or biomedical research come from two sources: embryonic stem cells, derived from fertilised egg cells discarded from IVF procedures; and induced pluripotent stem cells, where skin cells are 'reset' to their original, pluripotent form. They are seen as having promising therapeutic uses in regenerative medicine to treat devastating conditions that affect various organs and tissues, particularly those that have poor regenerative capacity, such as the heart, brain and pancreas. However, some scientists have been concerned that the cells may not incorporate properly into the body and hence not proliferate or distribute themselves as intended, resulting in tumours. Today's study suggests that this will not be the case and that stem cells, when transplanted appropriately, are likely to be safe for use in regenerative medicine. Professor Roger Pedersen from the Anne McLaren Laboratory for Regenerative Medicine at the University of Cambridge, commenting on co-author Victoria Mascetti's research findings, says: "Our study provides strong evidence to suggest that human stem cells will develop in a normal—and importantly, safe—way. This could be the news that the field of regenerative medicine has been waiting for." The best way to test how well stem cells would incorporate into the body is to transplant them into an early-stage embryo and see how they develop. As this cannot be done ethically in humans, scientists use mouse embryos. The gold standard test, developed in Cambridge in the 1980s, involves putting the stem cells into a mouse blastocyst, a very early stage embryo after fertilisation, then assessing stem cell contribution to the various tissues of the body.. Previous research has not succeeded in getting human pluripotent stem cells to incorporate into embryos. However, in research funded by the British Heart Foundation, Victoria Mascetti and Professor Pedersen have shown that it is possible to successfully transplant human pluripotent stem cells into the mouse embryo and that they then develop and grow normally. "Stem cells hold great promise for treating serious conditions such as heart disease and Parkinson's disease, but until now there has been a big question mark over how safe and effective they will be," explains Professor Pedersen. Mascetti's research breakthrough in this new study was to demonstrate that human pluripotent stem cells are equivalent to an embryonic counterpart. Where attempts to incorporate human pluripotent stem cells had failed previously, it was because the stem cells had not been matched to the correct stage of embryo development: the cells needed to be transplanted into the mouse embryo at a later stage than was previously thought (a stage of embryo development known as gastrulation). Once transplanted at the correct stage, the stem cells went on to grow and proliferate normally, to integrate into the embryo and to distribute themselves correctly across relevant tissues. Ms Mascetti adds: "Our finding that human stem cells integrate and develop normally in the mouse embryo will allow us to study aspects of human development during a window in time that would otherwise be inaccessible." Professor Jeremy Pearson, Associate Medical Director at the British Heart Foundation, which helped fund the study, said: "These results substantially strengthen the view that induced pluripotent stem cells from adult tissue are suitable for use in regenerative medicine—for example in attempts to repair damaged heart muscle after a heart attack.